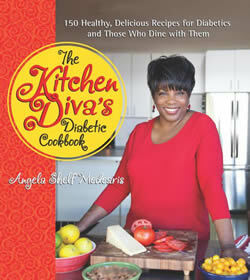 Angela Shelf Medearis is a chef and recipe book author known as “The Kitchen Diva”. She is a regular television guest on The Dr.Oz Show and The Today Show and celebrity-chef judge for cooking competitions. The Kitchen Diva’s Diabetic Cookbook contains a collection of 150 satisfying recipes suitable for those with diabetes. They are were created to meet the nutritional needs of diabetics without compromising on flavor. Throughout the book Medearis offers a variety of tips to help diabetics create a nutritious diet. She recommends three balanced meals and two or three healthy snacks each day. This helps to keep your blood glucose levels in balance. Advice is also included on budget-wise shopping strategies, meal planning and basic cooking techniques. The recipes in this book can be used by those with prediabetes, type 1 and 2 diabetes and women with gestational diabetes related to pregnancy. The recipes recreate the traditional flavors and rich textures of ethnic and comfort foods. Additionally, many kid-friendly recipes are provided that are tailored to the unique needs of children with diabetes. Whole wheat bread, oatmeal, quinoa, turkey, lean pork, eggs, seafood, low-fat milk, low-fat cheese, garbanzo beans, pinto beans, tofu, soy milk, peanut butter, walnuts, pumpkin seeds, flaxseeds, lettuce, spinach, tomato, blueberries, banana, applesauce, olive oil, salsa, low-fat mayo, fresh herbs and spices, Splenda, dark chocolate. The Kitchen Diva’s Diabetic Cookbook: 150 Healthy, Delicious Recipes for Diabetics and Those Who Dine with Them retails at $24.99. Click here to purchase this cookbook at a discounted price. Recipes are easy to prepare and budget-friendly. Color photographs are provided for many of the recipes. Offers nutritional tips for diabetics. Recipes will appeal to the whole family. Includes a large selection of healthy snacks and low-sugar desserts. Nutritional information is provided for every recipe. Will not appeal to those who don’t enjoy cooking. Exercise guidelines are not provided. This book offers a selection of ethnic and comfort food recipes designed to suit the nutritional needs of diabetics. It will also appeal to anyone who wants to eat healthier while still enjoying delicious food.